There is a lot of talk about capital inflows, rupee appreciation, concerns about export competitiveness, etc. It made me pull up the data to look at what is going on. The graph shows the nominal and real effective exchange rate of the rupee. The source is the BIS: the best computation of these indexes presently available. There is one constraint of this data: it ends in August. The picture shown there is rather benign. 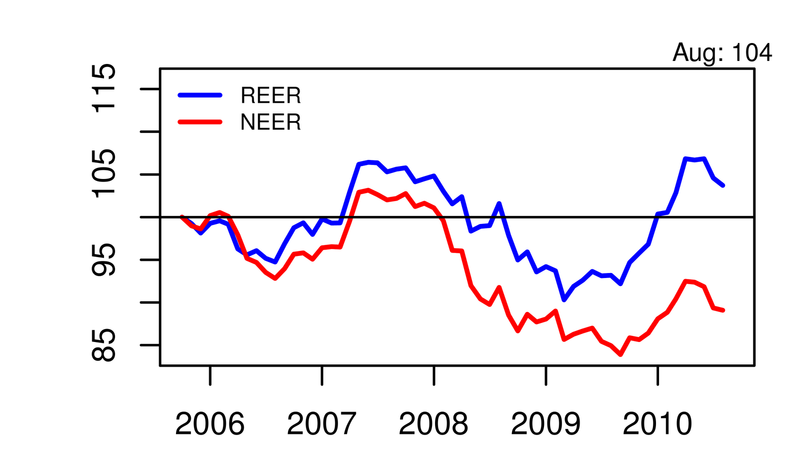 Over the five year period shown in the graph, modest REER fluctuations are visible. Over the recent period of roughly a year, where RBI intervention has subsided, it isn't clear that something dramatic shifted. And, I like to always remind everyone that the REER is a rather weak way to think about export competitiveness, so even if there was a sharp rise in the REER, we'd have to be cautious in rushing to conclusions about what it is saying. Is there a crisis on export competitiveness that is rooted in exchange rate misalignment? How can controlling nominal things (the exchange rate) influence real things (the real rate)? Given a choice of using the tool of monetary policy for the purpose of delivering low and stable inflation (which benefits every citizen of India), versus the purpose of delivering some modification of the nominal exchange rate (which benefits a sectarian interest at best), what is the best choice? How can RBI be held accountable to maximise the interests of the people of India, if it is to do active trading on the currency market? What checks and balances, and what accountability mechanisms, need to be put into place in order to run a trading room in the government sector? It is not so long ago (until early 2007) that RBI was actively trading in the currency market, championing the cause of India's exporters, and we saw how much trouble it got them in. In some ways, our inflation crisis today is the legacy of the unprecedented credit boom of the Y V Reddy years. Today's India is only more open than the India where Y V Reddy's regime tripped up on currency trading, so the challenges in embarking on that path today are even more daunting. I wrote a column in the Financial Express today about the first signs of life in stock lending. This is one of the last building blocks of the ecosystem of the equity market. Also see: Mobis Philipose in Mint on 13 September.